Made on what looks like a shoestring budget (that didn’t include the shoe), Invasion of the Star Creatures tells the story of two privates in the Army, Philbrick (Ball) and Penn (Ray), who yearn for duties more adventurous than garbage disposal. Following a nuclear test carried out nearby, they are ordered to investigate the crater that has been left behind. Led by their sergeant, Glory, a fast-talking hipster with all the groovy catchphrases of the time, Philbrick and Penn join three other privates on the mission, and discover more adventure than they ever could have expected. 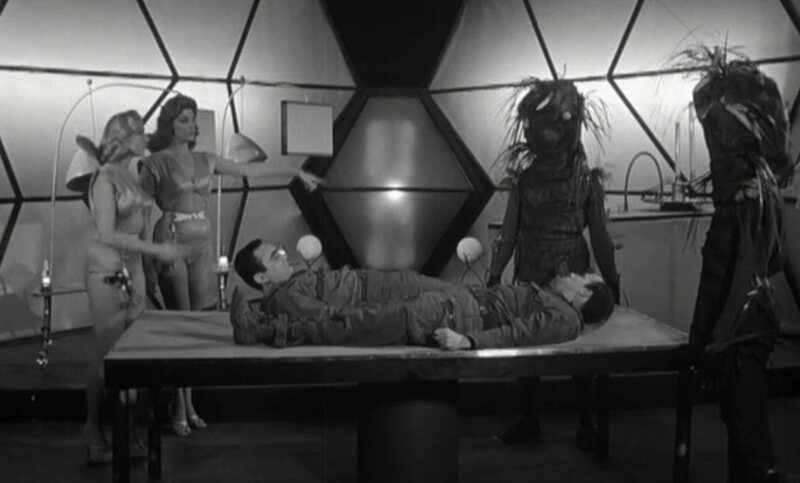 The crater proves to be the hideout of two aliens from the planet Callar in the Belfar star system, Dr Tanga (Victor) and her assistant Dr Puna (Reed). They have been on Earth for ten years, learning about mankind until they have enough information about us to enable them to return to their home planet and organise an invasion force. To help them they are assisted by slaves called Vege-Men. Philbrick and Penn risk being lobotomised, then imprisonment before escaping and attempting to bring help before saving the day by themselves… with a little help from the concept of love. 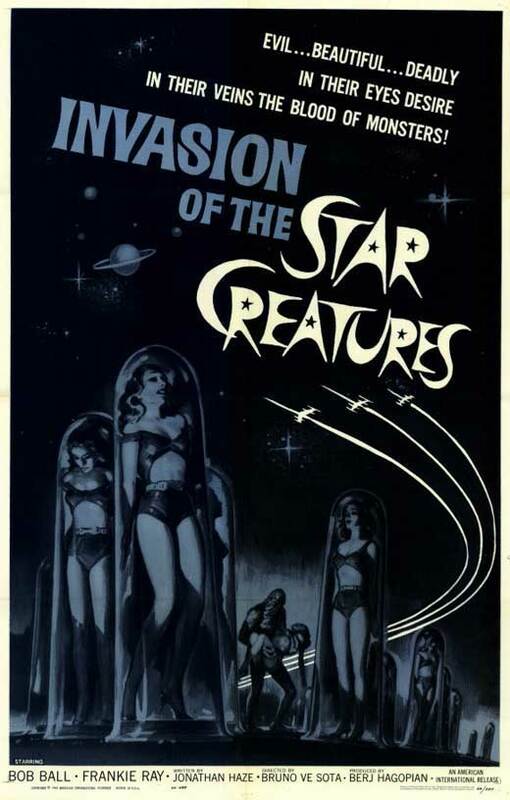 An Impossible Picture presented by R.I. Diculous, Invasion of the Star Creatures never rises above its low-budget origins, but it does move along at a decent pace, aside from the sequence where our hapless heroes encounter a group of less-than-helpful American Indians. Ball and Ray, while they appear to be a comedy double act who’ve worked together in the past, are appearing together for the first and only time, and have obviously modelled their performances on Abbott and Costello, Ball in particular adopting many of Costello’s mannerisms. Ray brings some impressions to the mix (Peter Lorre, James Cagney, Bela Lugosi, Edward G. Robinson), and acts as the straight man. Together they’re not a bad team and while the script by Jonathan Haze gives them enough corny lines to choke a horse, they’re amusing in an old vaudeville kind of way. As the improbably named aliens, Victor and Reed (now that sounds like a double act) are perfectly cast as statuesque Amazonians, although when called upon to act, let the side down badly (this was Reed’s third and last movie). Of course, the acting level is that of very broad comedy and Victor and Reed are required to be serious, but the moment when Victor looks to camera and raises her eyebrows sums things up perfectly. Director VeSota – who also directed the 1958 cult classic The Brain Eaters – does his best but is hamstrung by the limitations of both the script and the budget (he also appears as a passing motorist who gets knocked out by Philbrick in a fantasy sequence). The sets are typically minimal: one depicts a series of cave paths that the characters use to go backwards and forwards several times in their efforts to leave the aliens’ lair; it’s a static shot that involves the cast appearing from left or right at will. Several sequences are shot outdoors and as you may have guessed already, the crater never appears; the aliens are hiding out in a cave instead. The Vege-Men are worth a mention. They’re created by the aliens and have sackcloth heads with twigs and grasses sticking out of them. They’re absurd and laughable at the same time and serve, as if further proof were needed, of the paucity of the budget. They’re even worse than the creature in 1953’s Robot Monster. On the whole, Invasion of the Star Creatures is pretty bad. But it does have a certain charm and if you go into it accepting it’s a (very) low budget production and does the best it can then it’s actually quite enjoyable. Ball and Ray make for an entertaining double act, while Victor and Reed look appropriately attractive in their silver outfits. If the movie gets incredibly silly – and it does on several occasions – then it’s a reflection on the time it was made, and what audiences were used to. Rating: 4/10 – laughable in all the wrong ways at times but still worth a look despite the often wince-inducing humour.